This is the love story between Adiona, a Roman lady and Quintus, a slave and gladiator. Quintus is a christian with a great sorrow -and guilt- in his past and Adiona is a widow traumatized by her abusive late husband, sworn to hate men forever. She is an icy, distant woman, mistaken by many for evil, but deep down inside she still longs for the love her father witheld from her when she was a child, she needs a Saviour and a man to protect her. The attraction she and Quintus feel towards each other flares up when an attempt is made on Adiona's life and Quintus is appointed her bodyguard. From there the adventure begins. They find the Lord, they find healing for their hurting hearts, they find each other. And in the midst of it all, they have to find the would-be murderer and a way to be together. This is a sweet, romantic book, rich in period detail, with a touch of mystery and adventure. 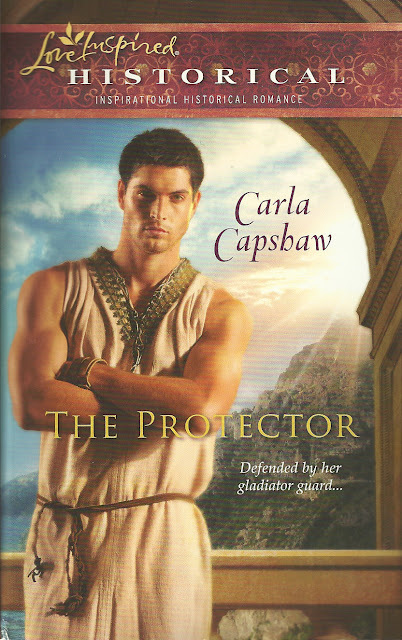 I am very glad that I didn't let me prejudice about Adiona from the previous book in the series, The Gladiator, (in which she was quite the villainness) spoil my enjoyment of this book. It was really well-written, in a way that drew me in, making the characters feel alive and the scenes greatly realistic. The only thing I disliked about this book was the way the characters sometimes behaved very modernly, which was not consistent with the era in which they lived. I understand that this was so that the author could make a point, but it quite drew me out of the story to think every once in a while, "wow, they would never say or do that". Hoewever, if someone is not so familiar of this particular century in history, they might not even notice it. Another thing was the characterization of many people by animal adjectives. There were snakes, cows, spiders, weasels, and so on, all over the place. I did not like that. First, I prefer to drive my own conclusions about the evilness of a character. And second, it made the speaker sound mean and un-christian. That really wasn't necessary, I really understood that the murderer was quite evil without them being compared to an animal. This lovely book, the second in the Roman Series by Carla Capshaw delighted me almost as much as the first and I am truly grateful to her for sending it to me for a review. If only every author of LoveInspired books wrote like her, there would be no other books in my home. I recommend it to Christians and non Christians alike. This is historical romance you don't often come across. I'm so glad you like The Champion!! That's wonderful!